Thorne-Moorends Town Council are pleased to announce that work has started on the new Community Hall and Pavilion at Coulman Recreation Ground, Thorne. Following a competitive tendering process, the contract has been awarded to Watfords of Wombwell Ltd. 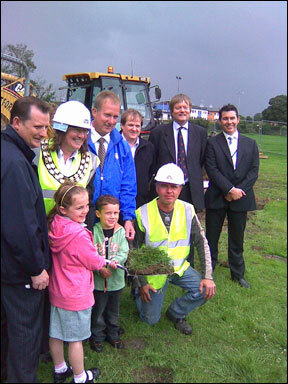 The contract commenced on 23rd June 2008 and work is due to be completed by the end of the year. The whole Coulman project, including relaying the pitches and drainage works is valued at just over £1 million. The Town Council is grateful for major funding contributions from the Football Foundation and The Coalfield’s Regeneration Trust and other funding bodies. Work on relaying and draining the pitches has already been completed.